spectro-aras.com • View topic - Call for monitoring of AG Dra by R. Galis & al. Call for monitoring of AG Dra by R. Galis & al. Re: Call for monitoring of AG Dra by R. Galis & al. My result for May 1 compared to my last two recent spectra. Also showing recent drop in Raman feature. Les 2 spectres suivants ont été obtenus respectivement les 6 (JJ = 2458215.504) et 24 (JJ = 2458233.419) Avril. L'animation ci-dessous permet de mieux apprécier l'évolution des intensités relatives des raies, en particulier les raies HeII (4686) et Hbeta (4861) entre ces 2 dates. 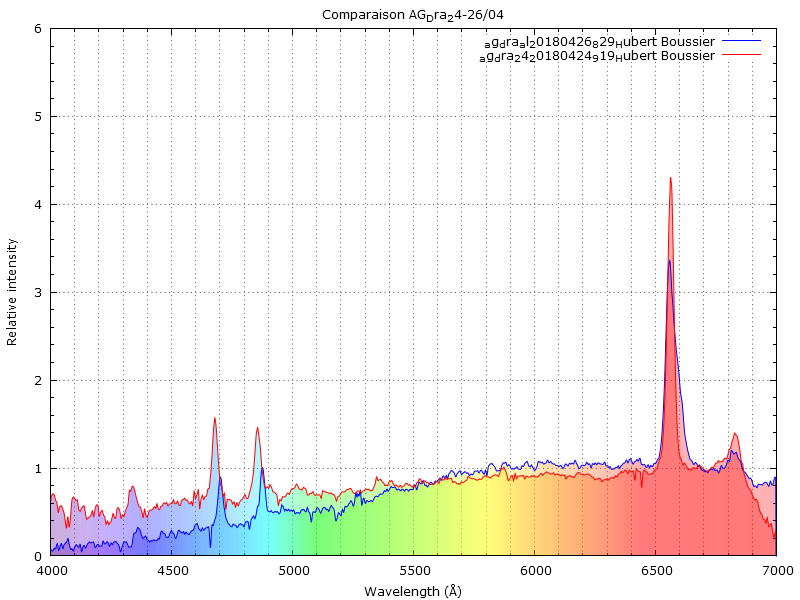 The two following spectra were obtained respectively the 6 (JJ = 2458215.504) and 24 (JJ = 2458233.419) April. 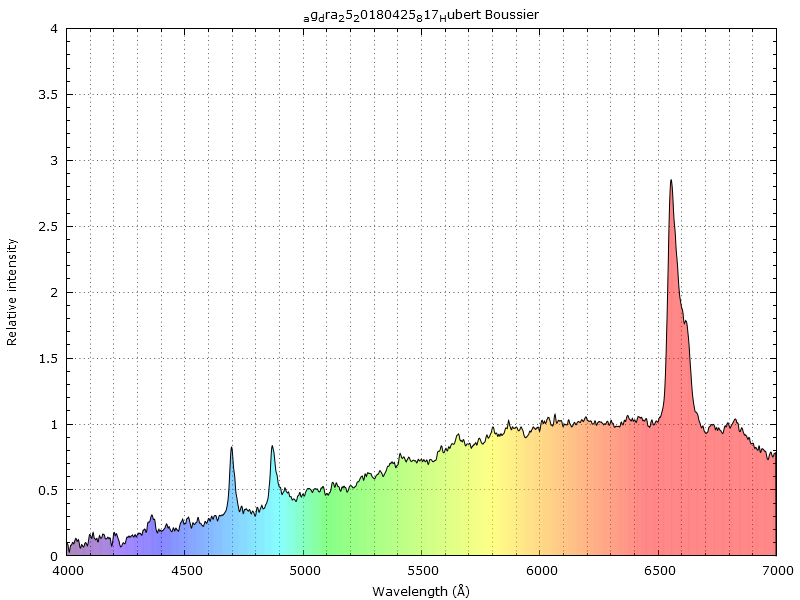 The lines identified with Plotspectra are the following (see at the top). The animation at the top allows you to better appreciate the evolution of the relative intensities of the lines, especially HeII (4686) and Hbeta (4861 ) between these 2 dates. From AAVSO data, the target looks returning to quiescent state. Thus, short outburst. Ne disposant pas d'un spectro, le week-end dernier je me suis amusé à faire deux spectres en très basse résolution avec un SA200 les 24,25 et 26 avril. J'avais un peu oublié la procédure de traitement avec un star analyseur, finalement par rapport au LISA, l'étalonnage et la réponse instrumentale ont été plus laborieux à faire et j'ai dû m'y reprendre plusieurs fois pour obtenir quelque chose qui approche le profil spectres postés sur AG Dra. La comparaison des profils du 24 et 26 montre que le résultat de l'étalonnage n'est pas encore idéal. 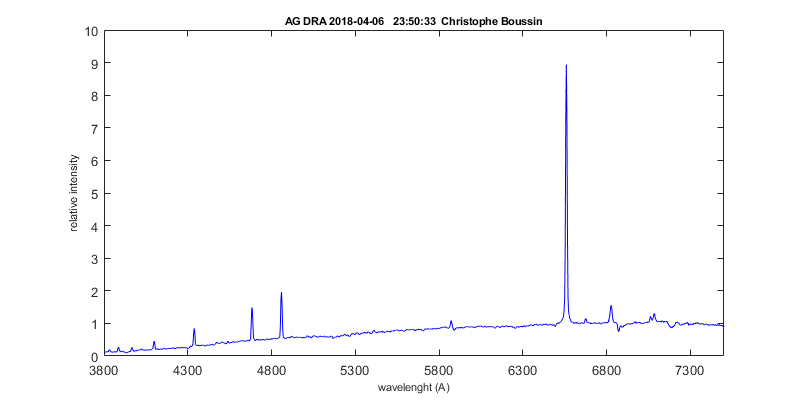 Message from Jaroslav: According to photometric observations of AG Draconis obtained in previous days, outburst is not over yet and the brightness continues to increase. 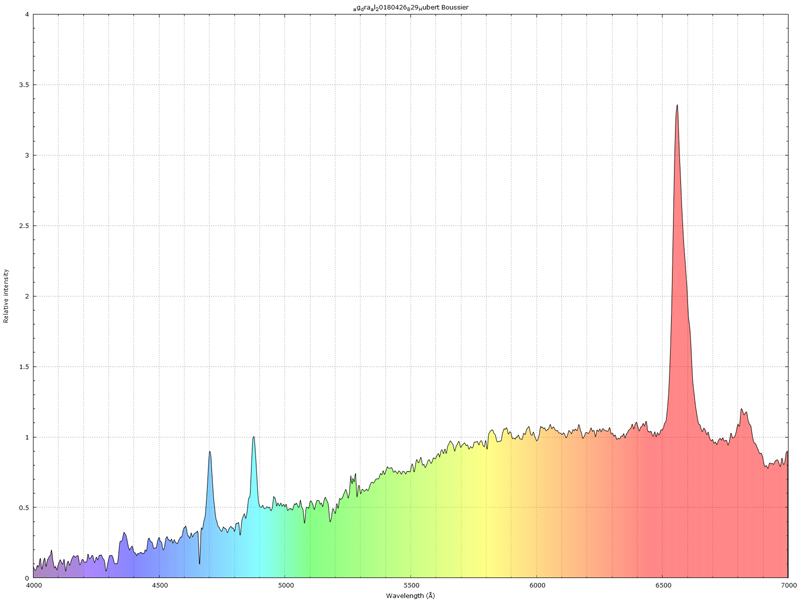 This is very interesting behavior because of not a very steep increase in brightness. 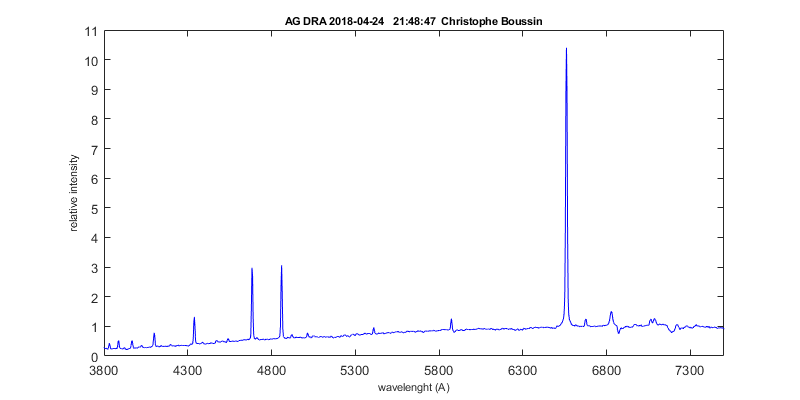 Moreover, AG Dra slowly achieves the values similar to the maximal brightness during 2016 outburst. 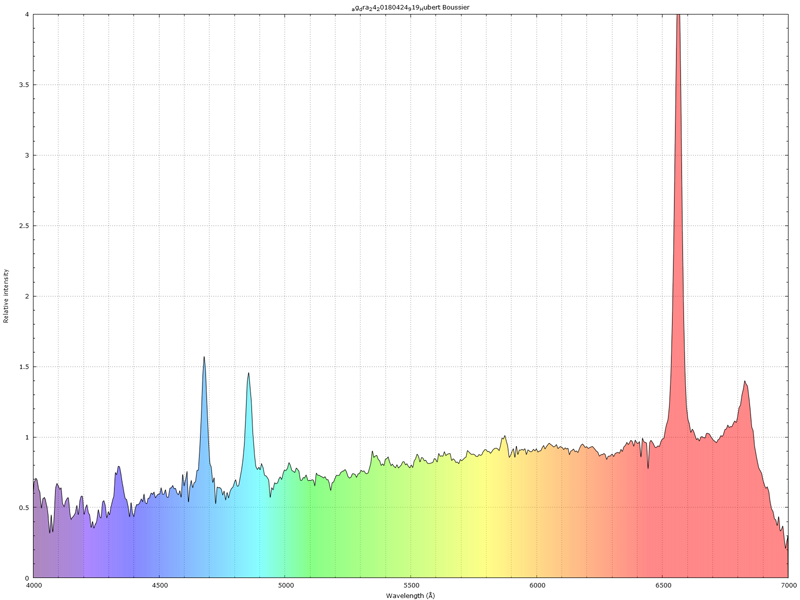 Spectroscopic coverage of the outburst is very good. Thanks to all which have so far been involved. Keep up the good work! I've managed to process all of my 3 nightly series (already available on the database) into form of EWs. As a new addition, I've extracted Pearson-correlation on the EW-serie between 2 features - in order to see which features are changing together (important to keep in mind: not absolutely). The 3 graphs are scaled to show equal time differences (a similar night window). The first 2 series were happening at beginning 2 nights of outburst, and 04.30 is special as the Raman OVI-feature was being at lowest. Conclusion: at different phase we can see different correlations between the feature changes (at the beginning H-alpha is correlating highly with R1, whilst on 04.30 it's near to 0). The correlation between R1 and R2 is something expected. As for HeI 7065, I am suspecting continuum determination noise might be present on it (and maybe on R2), perhaps I could work on this harder in the future. Error estimate was brought out by measuring a nearby continuum region per-feature, and taking a whole serie's EW stddev precisely. The Pearson-correlation is more about a choice of convenience (here I used GDL's 'correlate' function, being at hand). I'm wondering which error estimate method spc_ew is using (need a math formula or algorithm details). The article "Chalabaev, A. and Maillard, J.P. 1983, A&A, 127, 279" (the eps-Aur project you mentioned referring to) focuses on analysis of some Be stars H-alpha variability, but can't find any final conclusion which formula to be used in general. AG Dra is different in many ways (features shape are not gaussian, shortterm variance) so not sure if these theories apply here.